Pacific Accents Flameless Pillar Candle with Timer - Melted Top Design - 3" x 6"
There is nothing more romantic than a candlelit dinner, and nothing more peaceful than a darkened room with flickering candles. You can create the same relaxing atmosphere with these battery operated candles, without the dangerous fire hazard and messy wax drippings. If you have children or pets, you know that using candles can be a risky proposition, but these flameless candles are perfectly safe. These battery operated LED candles are completely wireless and very easy to set up. They include timers and can be used as indoor or outdoor lighting. There are flameless LED candles in both modern and rustic designs with styles that include glass hurricane candles, pillar candles and wall sconces. There are even real wax flameless candles. Enjoy all the ambiance and romantic allure of candles without the mess. These flameless lights can even be used inside tents on camping trips without any safety concerns. 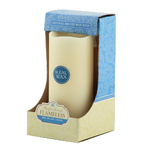 Give a long-lasting flameless LED candle to a loved one as a special romantic gift. Earthtech Products specializes in innovative, energy-efficient products for the home, the office and your outdoor environment. Pacific Accents Flameless Pillar Candle with Timer - Melted Top Design - 3" x 4"
Pacific Accents Flameless Pillar Candle with Timer - Melted Top Design - 3" x 5"
Pacific Accents Flameless Pillar Candle with Timer - Melted Top Design - 3" x 8"
Pacific Accents Flameless Pillar Candle with Timer - Melted Top Design - 4" x 5"